Our idea for a new business is called: Apptivity, what are you app to? It is a mobile application that offers a platform for searching, choosing and planning activities for consumers in the Netherlands. There are many types of activities like concerts, sports events, performances, gallery openings and so on. We had the bright idea to simplify the time consuming activity search. Apptivity focuses on all key benefits required by consumers: low price, amount and quality of information, efficiency, effectiveness, convenience, social interaction and reach of participants. At the same time the benefits required by the companies advertising events are also satisfied: higher penetration in the market, higher effectiveness, lower costs and better knowledge of their clients. Apptivity can be used with less costs and effort, what makes it a convenient and effective way to reach consumers. In return, people receive a great amount of information about activities and can become part of a social community. In this community, users can share recommendations and experiences from previous activities, give ratings and write reviews, and they can even organize activities themselves. 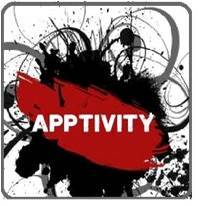 The activities listed in Apptivity are collected by the Apptivity’s administrators from several organizations. Organizations can also upload and advertise events by themselves. That of course is how we gain revenue by providing advertising space. Apptivity uses a pay-per-click model for this. Our app also offers the possibility to collaborate in the ticket sale. Based on the agreement with the organization, Apptivity can sell the tickets directly and receive a referral fee or link the users to the website where the tickets are sold (pay-per-click model). Another way that we earn revenue is by offering profitable premium accounts for the users of the app. With it they could get extra discounts and other bonuses that the organizations will offer them. Efficiency criterion: There are several reasons why the organizations would want to join the app. For example they are able to increase their reach through the platform, reduce some costs in advertising activities. The companies also profit from valuable feedback information in the form of reviews; as a consequence the consumers are offered discounts, as well as better and improved experiences. Furthermore the reduction in time and effort is highly valued by the users. In some of the cases the social factor from community belonging boost the utility of consumers even further. However time and effort of creating a profile and the fee payment decrease the utility for some cases. Institutional arrangements: Furthermore, given the spread of mobile applications in the last years and the collaboration of companies through online platforms the legislation regulating these business relations is established, allowing commercial practices, specifically reallocation of resources, under institutional arrangements. The ownership of the Apptivity platform and all the features that make up the organizations, the work collaboration contracts in all cases, as well as the social statutes have been recorded under the law. All these components meet without exception the Constitution of The Netherlands and in general the Dutch Institutional Environment.